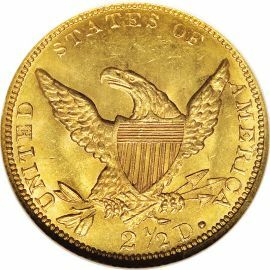 Classic Head Quarter Eagles were in production at the US Mint from 1834 to 1839. At that time, it was highly profitable to export gold and silver coins. In order to stop this practice, Congress, through the Mint Act of 1834, effectively lowered the gold content to 4.18 grams. This had the effect of keeping gold coins in circulation. eagle from the gold half eagle coins of 1807. Kneass' adaptation depicted John Reich's Liberty facing left, her curly hair cascading down the back of her neck, tied by a headband inscribed with "LIBERTY". The date is below and the entire design is surrounded by thirteen stars. Head motif so officials decided to delete the motto "E PLURIBUS UNUM". This provided the public with an easy way to distinguish the new, lighter-weight pieces. 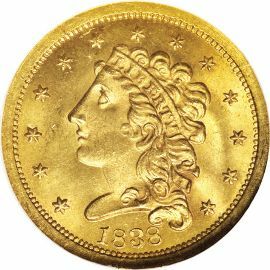 These are not necessarily considered to be rare gold coins; however, in high grades of MS-64 to MS-65 they can be relatively expensive for the average collector.